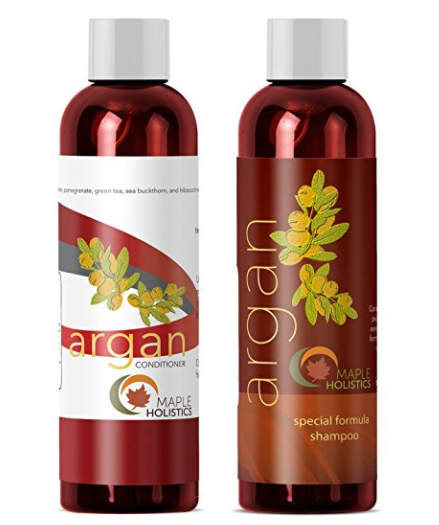 We were given the opportunity to try out Maple Holistics' Argan Oil Shampoo. Maple Holistics features products that are all natural, made in the USA, they are cruelty free and are sulfate free. If you are looking for a natural product to use on your hair, you need to visit the Maple Holistics site. They also have other bath and body products as well as a skin care line. One of my oldest daughters tried the Argan Oil Shampoo first. She was surprised, because so often natural products do not lather, but this argan oil shampoo did. We were originally offered the Tea Tree Oil Shampoo, but one of my daughters reacts to tea tree oil and I did not want to take a chance on her reacting to it. The Argan Oil Shampoo left her hair feeling clean, shiny and left behind a wonderful fragrance that lingered for hours. She still uses a conditioner, because her hair is dry, but she can tell a difference in how her hair feels after using her old shampoo. I saw a few other products I would like to try out some time. Speaking of which, they have a page where you can get a free sample of one of their products. After you look through their site, be sure to visit the Free Sample page. Thanks for stopping by today! See you soon! !